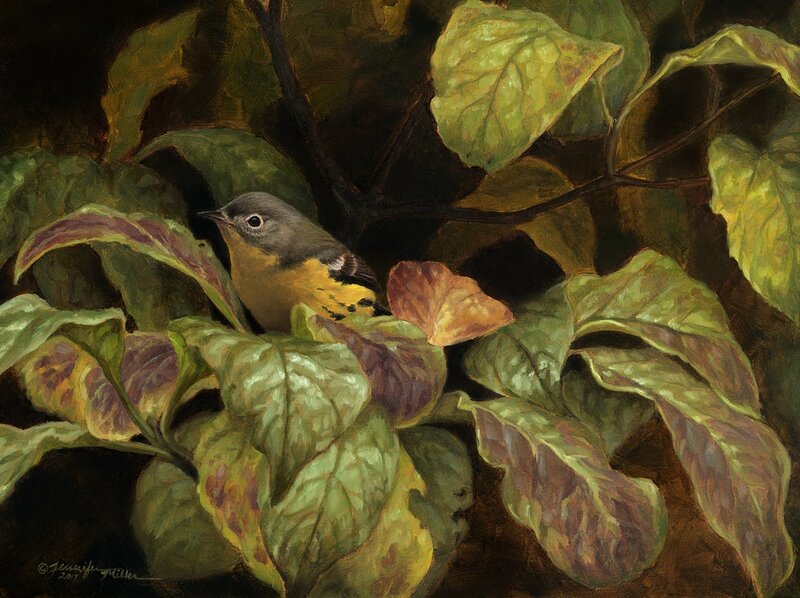 ​Autumn Magnolia ; Oil; 9" x 12"
​Trying to explain my passion for birds is like trying to explain one’s favorite color. Color preference is deeply rooted at a subconscious and often emotional level, and so too is my love for birds. It is relatively straightforward to create a painting of a beautiful bird, for birds are inherently beautiful! I attempt to go a bit further to capture the personality and behavior of our feathered friends in my work, as a way to make that emotional connection with my subjects. ​Jennifer Miller is a professional artist creating paintings of wildlife and fantasy creatures, in addition to crafting sculpture. Though having received no formal education, she has always been driven by studying birds and recreating them in her artworks. She works primarily in oil and acrylic, and occasionally in a digital format. By studying wildlife, and combining it with her vivid imagination, Jennifer is also a renowned fantasy artist. She has created many fantasy paintings and illustrations for publication, including several novel covers. In 2014, Jennifer won the prestigious U.S. Federal Duck Stamp competition, and her stamp will generate millions of dollars for habitat conservation. Residing in a rural setting in the western end of New York State in the USA, Jennifer is joined by her husband Brian, three parrots, and a delightful flock of chickens.